Buy recipes books and kitchen products online, delivered to your door. Featuring the best recipes from all previous Spirit House books, plus 20 new recipes. 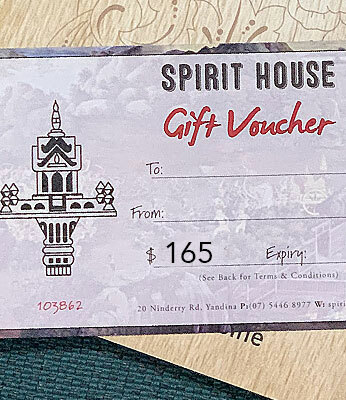 The perfect gift or souvenir of your visit to Spirit House. Our smallest book demystifying and guiding you around Asian ingredients. Packed with pics, tips, history and some recipes. Makes a great gift idea for any Asian food lover. Our old Hot Plate book gets a make-over with new Asian inspired BBQ recipes that turn a casual backyard gathering into a gourmet event. The original cookbook, first published in 2004 and with its classic recipes it remains as popular now as it was 14 years ago. Featuring our whole crispy fish recipe and great curry pastes, this will get you started on your Thai Food journey. Lemongrass, Ginger & Pear Blend: We start with organic lemongrass and add in some ginger for a taste of Asia. Then BAM! out of nowhere a blast of pear joins in the fun. Chamomile, Spearmint & Petals - a bit of zing and exotic flowers adding to the bouquet, make this tea both pretty and delicious. What more could you want from a soothing tea? All the dry ingredients for Chinese master stock - just add sauces listed on label and follow the recipe. Make a batch and freeze for future use. Make your own red curry paste - all those hard-to-find dry spices in one pack. Buy the fresh ingredients listed on the label, follow the recipe and pound away. The best bottle opener on the planet. Simply push down and the cap is swiftly removed. The hard-to-find Kiwi Brand Paw Paw Shredder is the only shredder to use when making green pawpaw salad. This $150 voucher can be used in the cooking school, restaurant or bar. Combine it with a book and you have a fantastic gift.